There is no better evidence for this religio-spiritual yearning in its popular form than the string of festivals that is spread over the year. 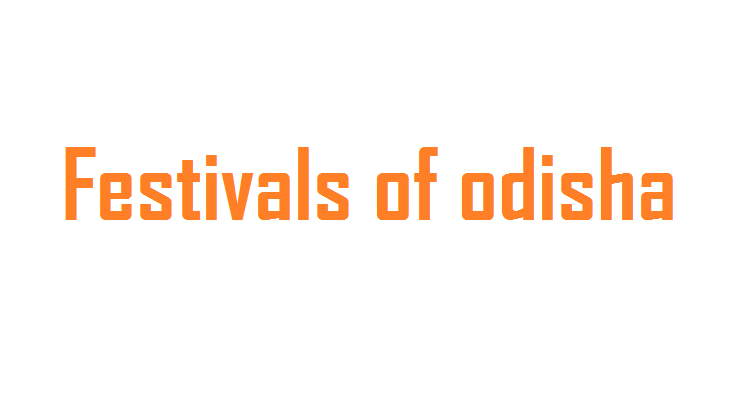 As has been said earlier, Odisha is a confluence of the Aryan, Dravidian and Adivasi cultures all of which by the quest of the numinous. Dolapwnima or Holi is the most famous spring festival of India. 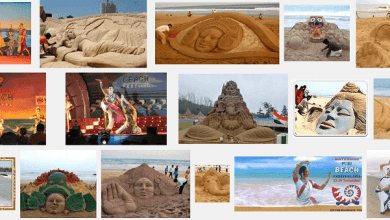 Usually celebrated in March It has special properties in its celebration in Odisha where it is a five day affair, especially in the rural areas. The images of Krishna are worshipped form Dashami (10th day of the bright fortnight) to the full moon day. The images are taken in decorated vimans, small wooden temples, carried on the shoulders of bearers from house to house where offerings are made to them. After the tour of the village the vimanas from different villages are assembled in an open field and the time is spent in bhajana and kirtan. Jatras and palas are also held in the area. The day after the full moon day people throw coloured water on one another and smear each other’s faces with coloured powder (Abir). The festival is specially important for cattle owing to their association with the cowherd boy Krisllna. They are bathed, anointed with vermillion, garlanded and fed sumptuously. The festival is connected with the destruction of the demon Holikasura or the she-demon Holika by making a bonfire, for which the festival is called Holi. 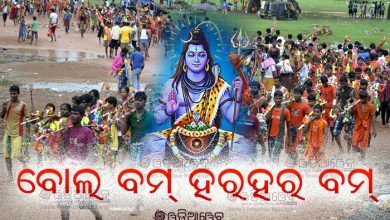 Such Melanas or Fairs continue till the month of Chaitra in different places of the district of Cuttack, Puri and Ganjam. 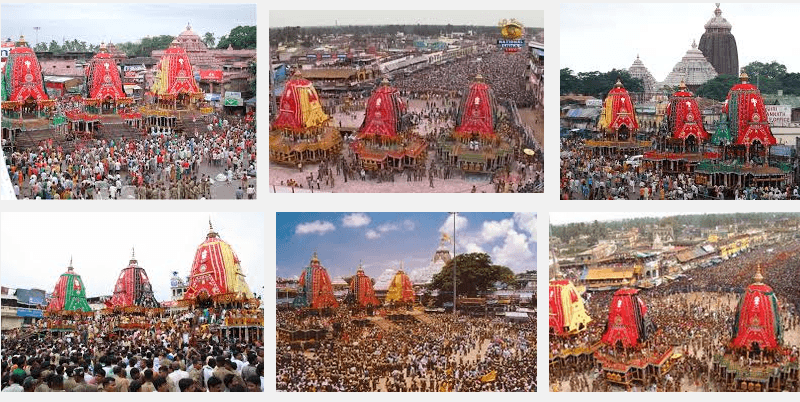 The most famous Odisha festival is of course the Ratha Yatra or Car Festival (June-July) which attracts pilgrims and visitors from all over the world. 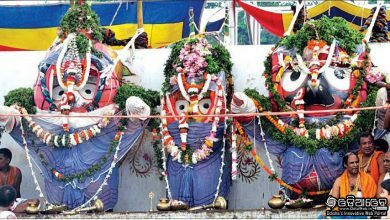 On the full moon day of the month of Jyestha known as snana Purnima, the idols of Jagannath, Balabhadra slid Subhadra are brought out and bathed on a pendal known as the snarlamandap according to religious rites. Then they are believed to become indisposed and are confined to a solitary abode for a fortnight where they undergo treatment, are offered special ayurvedic medicine boli and some special liquid diet called sarapana. Alter a rest of fifteen days on the second day of the lunar month huge chariots are pulled by thousands of people, irrespective of religion, caste or creed to proclaim their universality and accessibility, to humanity at large. The chariots are cleaned by the Gajapati Maharaja of purl with a golden broom to proclaim that he is the first of the Lord’s servants and on this particular day he performs the duty of a scavenger to demonstrate socialism in action and the dignity of labour. 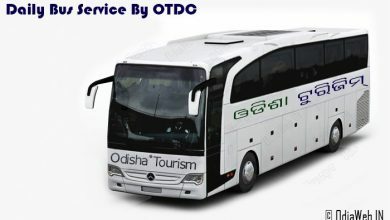 ‘this act is connected with ” famous incident in Odisha history in course of which the king Purushottama Deva was outwitted by his minister to marry the princess Padmavati. The deities then So to Gundichaghar where they stall for eight days at the end of \which the return car festival (Bahuda Yatra) takes place, One has only to see the vast sea of humanity on these occasions to convince oneself about the influence of religion on the people of Odisha for whom Jagannath is no other Supreme Brahman, without beginning and without end, and the saviour of mankind. 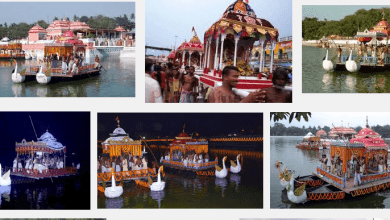 To commemorate the glorious past of commercial voyages to the islands of Bali , Java and Sumatra by Odisha Traders , big fair called “bali Yatra” is held in Mahanadi River Bank at Cuttack on the full moon day of Kartik. Dhanu Yatra relating to the episode of Lord Krishna’s visit to Mathura witness the ceremony of ‘Bow’ is colourfully observed at Bargarh a western Odisha District. The town of Baragarh becomes Mathura ,the river Jira becomes Yamuna , and village Amapalli on other bank of river becomes Gopa. Different acts of Puranic descriptions are performed in this festival. The Folk Tradition The festivals of the Adivasis are a part and parcel of their social life; they prepare a key to the appreciation of their beliefs in the supernatural spirits and their communal togetherness. The- same folk tradition and spirit are manifested through the numerous Vratas and Oshas, observed by the Hindus, the former having the authority of the scriptures and the latter being the product of social beliefs and practices, especially those observed by the women folk for the welfare and prosperity of their near and dear ones, for begetting sons, wishing long life of their children, recovery of their Own selves and their near and dear ones from ailments and obtaining salvation. They are associated: With the performance of rituals and recitation of a sacred verse tale connected with the occasion, usually elaborating the benefits accruing from the observance of the rites and punishments from the failure to do so. Most of these observances are marked by a spirit of sanctity even among the poorest folk. They clean up the premises, decorate their houses. Particularly the spot of worship with flowers and draw, in rice paste or multi-coloured powders, artistic designs on the floor and walls at the place. The priests do not play ally part in the Vratas and Oshas; these are usually celebrated under the supervision and direction of women, which testifies to the simplicity, easy belief and tenderness characterising the folk or communal spirit. They help in augmenting the religious or spiritual life of the people enabling them to resist the temptations of the worldly spirit or materialistic way of life. 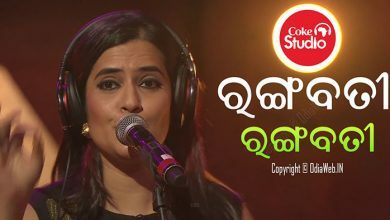 The important Oshas are Jahni Osha, Bodhivamana Osha, Dutia Osha, Sasthi Osha, Khudurukuni Osha, Puajiuntia Osha, Kharkhari Osha, Dhananlanika Osha, Bhaijuntia, Nishamangalavarta Oshat and Kanjianala Osha. The important Vntiis are: Sudasa Vrata, Vinayaka Vrata, Rabinarayan Vrata, Sambaradasami Vrata, Somanath Vrata, Savitri Vrata, Nagarchuuthi and Ananta Vrata. Among them Puajuntia and Bhnijiolltia are observed: in the western region, Kharkhari in the southern region. 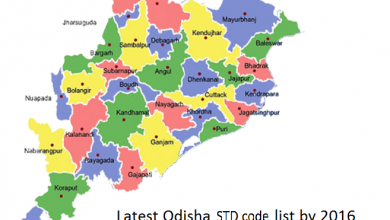 Khudurukuni Osha which is observed by unmarried girls on the Sundays of the month of Bhadrab for the welfare of their brothers is observed in the coastal districts. Another Oriya Osha is Prathamastami the first eighth day of the month of Margasira on which a rite is held .for the long-life and prosperity of the eldest child who is offered a lighted lamp ovation by the senior Female relatives, mother, aunt, grand mother, etc. followed by elaborate rituals during which the Glory of Mahalakshmi is recited. Raja is another special Oriya festival celebrated by girls with eclat, It is observed for three consecutive days from the day preceding Jyestha Sankrati to the day following it during which Mother Earth is supposed to be in her menstrual period; it is thus a fertility rite. The girls decked in their sartorial best away in swings and pray to Mother Earth for their welfare. It is one of the moat memorable festivals of rural Odisha along with Kumara Purnima which is held on the full-moon night of the month of Aswin, soon after Durga Puja. The latter is also celebrated by girls for the well-being of their brothers and for obtaining handsome. husbands. Makar Sankranti and Vishuva Sankranti are observed to celebrate the advent of Spring and the New Year according to the Indian almanac respectively. Like Makar which is observed by the Adivasis and the Hindus alike though in different styles, Chaitra Parva (Chait Parab) is a popular folk festival observed all over Odisha. In western Odisha, the festival held in honour of Lord Siva is called Dandayatra. It is associated with a dance called dandanata commissioned by a household person with a wish, especially for a child. A group of 13 persons, led by their chief called pata bhoku, holding a danda or stick perform the dance. The stick symbolises Lord Siva as Ladudeswara (stick-shaped god). In the coastal region the festival held in honour of either Siva or Sakti is known as Jhamuyatra in which devotees perform penance like walking on fire or a bed of thorns.